Over the past 7 years (or so), I’ve had the privilege of working with, teaching, and consulting with over ten thousand Entrepreneurs (Yeah I know a lot of people say that – but I’ve got the stats to back it up 🙂 ). I’ve learned a ton from everyone I’ve worked with (and I hope they’ve learned a ton from me too). One of the biggest problems that I’ve seen Entrepreneurs make is not having a real sales and marketing strategy. Often times it’s the last thing that people want to think about. Product strategy – check. Business plan – check. Customer support strategy – got it. Sales and marketing strategy – I’ll get to that later. A couple of months ago I was in Austin, TX at SXSW. A couple of us were talking with a few of the “startups” that had booths at the event. We were all amazed at how many businesses there couldn’t succinctly answer the question “So, what do you do?”. It boggled our minds how these people got any level of funding to get a booth let alone build a business around it. Based on what we saw at SXSW being “pre-revenue” is the new thing to be. To me “pre-revenue” means I don’t know how to sell or monetize what I’m doing – aka I don’t have a sales and marketing plan. Contrary to apparently popular belief – starting a business isn’t like the Field of Dreams. It’s not a “If you build it, they will come” type scenario. People aren’t going to magically walk out of a corn field with their credit cards in hand ready to give you money. You have to have a plan – you have to have a strategy. What makes up a great strategy? My good buddy and colleague Justin MacDonald (aka JMac) shared a great framework he uses to explain what makes up an effective strategy. 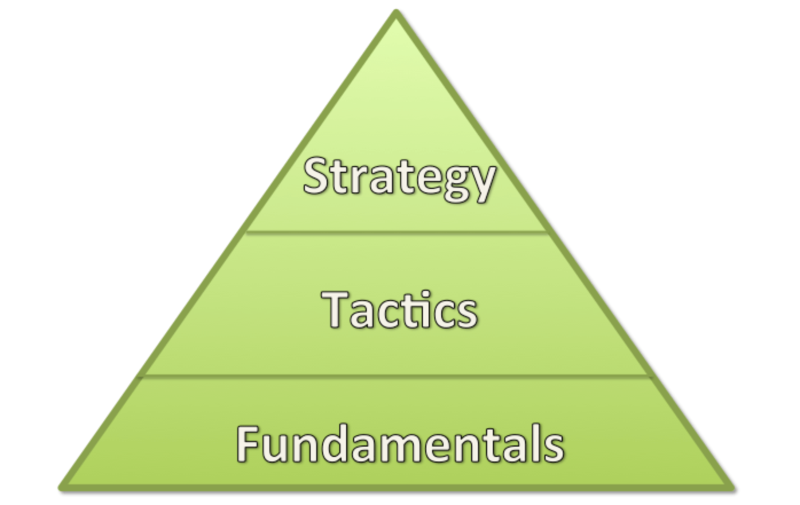 There are 3 basic components to an effective strategy: Fundamentals, Tactics and Strategy. Let’s break down each component. Make a list of all of the fundamentals you have in your arsenal. Side note: If you feel like you don’t have enough fundamentals in place, the best thing to do is to start using new fundamentals. If you feel like you aren’t good enough to have them be effective – start using them. The more you use them the better you get. Even pro athletes still have to practice their fundamentals. Review the different tactics you’ve leveraged in the past and make a list of the ones that worked and the ones that didn’t. If you’re not familiar with Lifecycle Marketing – go read this blog post. What is Lifecycle Marketing? Map out your ideal customer journey for each of the 3 high level sections of Lifecycle Marketing (Attract, Sell, Wow). What do you want your prospects/customers to experience when working with you. Identify tactics that can be used to support that experience. If there aren’t any in your arsenal – go ask Google what else you might be able to do. From your list of tactics – identify what fundamentals can be leveraged or added to support the tactics you want to use. Yeah I know – step 7 is the hardest. In an upcoming post I’ll outline a method I’ve used with lots of people (including Infusionsoft) to execute quickly. It’s awesome, I promise. There you have it. How to build a sales and marketing strategy. I’ve used this process a lot lately and have had great success. The best part about all of it is, it gives you something to focus on. Instead of just trying to launch tactics (aka Campaigns in Infusionsoft) you have a bigger goal that each of the tactics are driving for. It really works well. Now it’s your chance to share with the world. What fundamentals, tactics or strategies are working best for you right now (or in the recent past)? « That’s Some Next Level $@#%^! Great post Jordan. It call comes back to the ideal customer journey. People forget that the vision they have is just their strategy once manifested. So work backwards and figure out what it takes to arrive there, eh?